Yesterday, Nokia posted their final financial results before the the Microsoft deal closes. Unfortunately, the part of Nokia being sold Microsoft doesn't seem to be in great shape. Nokia's recent traction with the Lumia range seems to have stalled as they announced a 7% sequential decline in unit sales. Let's take a brief look at the causes of the decline and what Microsoft is really buying. 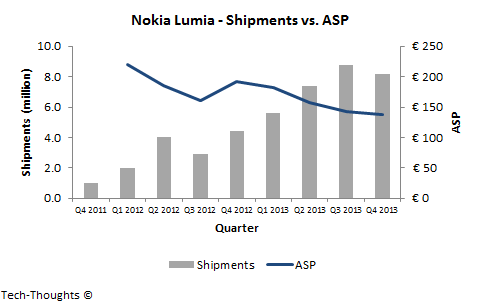 The chart above shows Lumia shipments and ASPs for the past eight quarters. As we can see the Lumia's ASP has continued to decline as shipments grew. This reinforces the fact that the Lumia sales mix was dominated by low-end variants - primarily the Lumia 520. We need to keep this in mind while examining the cause of the Q4 decline in shipments. Some analysts have suggested that the announcement of the Microsoft acquisition affected brand sentiment, which caused this decline. The problem with this line of reasoning is that it is limited to well-informed, high-end consumers. While this may certainly be true, these customers could not have constituted a meaningful proportion of Lumia sales - certainly not large enough to cause a 7% decline in a holiday quarter. The ASP decline in Q4 was also in line with previous quarters and not significant enough to suggest a sudden change in the sales mix. The most likely cause of this decline was increasing price competition from mid-tier and low-end vendors in the increasingly commoditized smartphone space. The change in brand sentiment may not have been a big factor in Q4, but it will become a major factor going forward. Nokia's brand is still the primary reason for the competitiveness of low-end Lumia devices against increasingly aggressive mid-tier and regional vendors. After the Microsoft acquisition closes, the loss of the "Nokia" brand is likely to have a significant impact on Lumia sales. Keeping in mind the increase in price competition, this acquisition doesn't quite look like a recipe for success.